Lately I've been thinking about Carrie Page (and the final moments of S3) and how it exists in relationship to the ending of FWWM. This is something I (and a lot of other TP fans) have pondered over the past year, and I've had difficulty accepting that Carrie Page screaming at the Palmer house occurs after (or instead of) Laura crying tears in the presence of her angel in the Red Room. For a while, I was content to think that some of the scenes in TP take place outside of linear time, and are always occurring or echoing throughout the series. 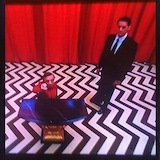 Case in point, Cooper meeting Laura in the Red Room. We see several iterations of that same sequence, in Cooper's dream, during Cooper's visit to the Red Room, and again at the beginning of S3. I also think Coop staring at Laura's empty chair in the final episode is a callback to this meeting; he's experienced it several times before, and he knows something is missing. If that one scene could be eternally reoccurring, then it stands to reasons that Laura being comforted by the presence of an angel (and Coop) could always be happening as well, in some form or another. But if it is already always happening, then why does Cooper bother finding Carrie Page and bringing her to the Palmer house? Is it a simple Back to The Future scenario where he simply has to correct mistakes he's made to a timeline? And how does the whole Carrie Page experience fit into Laura Palmer's story arc, mainly as depicted in FWWM? Jesus escapes death on the cross when an angel helps him escape. He then leads the life of a normal man, marrying and having kids. Many years later, on his deathbed, he discovers that the angel who saved him was actually the devil, so he asks God to let him die for the sins of man, and he ends up back on the cross. I don't know why, but I'm thinking that Cooper might be Laura's satan, and that he lures her into a life that can never be right or true. Cooper obviously thinks he is doing a good thing, rescuing Laura from her death (he also shows good intentions coupled with lack of understanding when he warns her not to take the ring in FWWM). 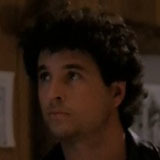 But the life Laura finds herself in afterwards, as Carrie Page, while it might have been good or fulfilling at one point, ultimately ends with a man shot in the head in her living room. We don't know much about the life of Carrie Page, and this is just a guess on my part, but I think Laura Palmer was living the destructive lifestyle depicted in FWWM, right up until Cooper arrived at her front door in Odessa. I think she might have thought she escaped the horrors of her youth, by leaving Twin Peaks and her father (and Sarah), but they stayed with her all her life, whether she knew it or not. Sometimes in life, when people flee or shy away from something, they can become it in a strange way, especially in regards to children subconsciously emulating their parents' behaviors. We primarily view Cooper's quest to find Laura through his perspective, but in some sense I feel like Carrie Page is somehow akin to the crying woman in Inland Empire, who sees her own emotional turmoil reflected in the television in her bed room. Both women are trapped until an outside force opens a door and lets them out. In Inland Empire, it is suggested that Laura Dern is a personification of the crying woman's own struggles, and eventual triumph. Maybe we could say the same about Cooper showing up in Odessa, and perhaps even Cooper's own odyssey of fractured selfhood is a reflection of the divisions within Laura's own soul. And I think ultimately, this is all important for Laura Palmer's character arc because she has to see what kind of life she would live if she did not confront her father and refuse his influence. I feel like the ending to S3 somehow takes Laura back to the night of her death, and only after seeing her possible future can she, with confidence and strength, take the ring and accept her death, similar to Jesus in Last Temptation. Cooper's "what year is this statement?" could be suggestive of a possible blurring of 2016 (or whatever year S3 is) and 1989 as well. And of course, there is the whole thing about Laura being born from the Giant/Fireman's head, so there are divine origin similarities too. Obviously this isn't a perfect theory (is any TP theory though? ), especially considering how Cooper can seemingly get things wrong (don't take the ring, preventing Laura from dying), then seem to maybe get things right (bringing Carrie to Palmer house), and the fact that we can't be certain if he is right or wrong in either case. But Cooper does change through this, and the only way I can think to account for it is to say that his warnings about the ring are a manifestation of Laura's own anxieties about accepting the truth about her father, and his rescue of her in the woods is her own subconscious desire to run away from everything in Twin Peaks. He is the satan to her Jesus here. But when Laura is ready to go back to Twin Peaks, face the truth, and confront it all (including her mother's own complicity), Cooper is transformed into a straightforward and serious character, who never smiles and speaks in a very matter of fact way. Cooper is the hero that Laura needs, but as her needs change, so does Cooper as well. And if Cooper is/was her satan in this analogy, then perhaps Laura's devils are her doubts, anxieties, and fears that prevent her from standing up to evil. But if Cooper can be symbolic of all of these negative aspects of Laura, maybe he can also be the embodiment of her strength and courage as well. He might have been the devil that tricked her into avoiding death, but he also stands with Laura as she basks in the glory of angels in her finest hour. Cooper is an integral part of Laura Palmer's journey, and he might in fact be a literal part of her, period. I started writing this to understand how Carrie Page fits into Laura Palmer's narrative and the Twin Peaks story as a whole, but now I find myself wondering how Dale Cooper fits into it too. Have you seen The Last Temptation of Christ? Cooper isn't going to stand at the Palmer house cracking jokes about penguins. There is room to dream of some religious thoughts regarding Twin Peaks but I think you should try looking into other religions and spiritual thought. Have a look at Martha Nochimson's latest book DAVID LYNCH SWERVES. This mention of Cooper as Satan is about as plausible to me as Laura being a devil somehow - I think its way more complex and subtle than anything so fire and brimstone. No I've not seen the Passion of the Christ. I've known what happens in it since I was a kid, so I've never felt too compelled to watch it. I obviously feel like I should watch it now, mainly so I can put these thoughts to rest. Yeah, I don't think Twin Peaks has many (or any) strong connections to Christianity per se, I just think the character of Laura Palmer's Carrie Page experience in Twin Peaks S3 might be similar to the character of Jesus' marriage / old age experience in Passion of the Christ, namely in that they function as pre-death 'visions' that allow the characters to psychologically cope with and accept death. I hate to reduce anything in a Lynch film down to a simple psychological process, but thinking of the Carrie Page stuff this way has helped me contextualize it as a part of Laura's story. But yeah, I agree. The good/evil binary of Christianity is sometimes a narrow way of looking at the world/tv shows. I didn't feel Cappy was trying to argue that TP is a religious parable, Laura as Jesus or something. Since season 3 I have reevaluated my take on Cooper. And I do find his character has taken on a darker aura. One example, season 3 has a Bad Cooper. I have certainly reinterpreted 2 scenes from FWWM. "Laura don't take the ring" had always puzzled me in the past. But now, I see it as Cooper in his hubris intentionally trying to keep Laura from her angel. And the in the final scene I see an angel of light in front of Laura, and Cooper as darkness behind her. I use to see Cooper as Laura's arm. Like Mike (Gerard) and his arm (TLMFAP). And I'm struggling to reconcile that. I see their positions now almost like Cooper pulling her out of the White Lodge to help with the personal metaphysical quest he is on. Lynch who rarely comments on the meaning of any of his films said FWWM was very important to the subject in season 3. And those are my two cents on the matter. Cappy wrote: Lately I've been thinking about Carrie Page (and the final moments of S3) and how it exists in relationship to the ending of FWWM. I think this is a fascinating theory, Cappy. Cooper is not Satan or the devil, exactly. He is a flawed, tragic hero. He means well, is a good person at heart, a talented detective, but he makes mistakes like all of us. His "Don't take the ring" was said because he is a nice guy and he did not want Laura to be brutally murdered. Perhaps because of lack of understanding of the situation, he does not realise that if Laura does NOT take the ring, she will be possessed by Bob. Which is worse? It's difficult to say. He has to weigh up the consequences. Does he make the right decision in going back in time to rescue Laura? Perhaps he inadvertently makes things worse. Carrie does seem to be living a chaotic lifestyle in Odessa, but she is a wild girl, and might find a conventional husband, kids, white fence, apple pie existence a bit boring. Who are we to judge her? We ourselves have sinned. So, yes, there is religious imagery in TP, especially the angels. Angels are from Judaism, Christianity, Islam, Zoroastrianism. "We live inside a dream" is an oblique ref. to the Upanishads, ie Hinduism. It's a v. spiritual TV programme. You can see the Log Lady as a seer or prophet, the shaman of the town of Twin Peaks. regarding Swerves. Cool book, but I was a little disappointed. As a guy who reads a lot about physics most of Swerves was pretty trite. vague and repetitive associations between concepts like entanglement and various Lynch characters. A great article or post but not enough material for a great book if you ask me. I was hoping she would expand the discussion in Swerves to include topics like non-linear systems, scale invariance, Godel's incompleteness, and a slew of others that I think tie in with Lynch films.